Cloud Bitcoin Miner: Remote BTC Earnings is an app for Android devices which, as the name suggests, mines Bitcoins. Due to the craze for Cryptocurrency, there has been a rush of apps that claim to mine one or another cryptocurrency. But unfortunately, most of them are fake. I reviewed CryptoTab here which also mines Bitcoins. So is Bitcoin miner app scam or legit? How much can you earn/mine? Is it worth the time? I'll be answering all those questions in this review. You don't have to do anything except press the start button. Once you have done that the app will begin to mine. There is also the option of referring other users to the app. You can share your invitation code with your friends and after they have entered it you will earn 9% of what they earn. You can also buy one of the premium plans to boost your mining speed. 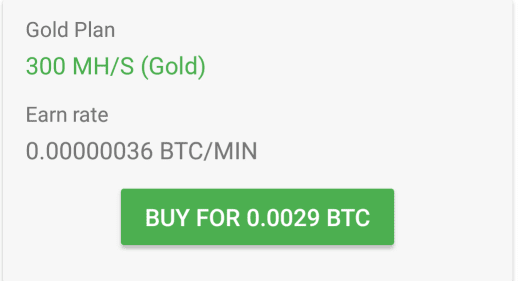 So they are saying that if you buy this plan you'll mine at 300 MH/s. Which is impossible if you know how Bitcoin mining works(it is super complicated). To be able to mine Bitcoin at a reasonable speed to you need a really powerful computer, not the one you use at home. It’s impossible to mine at higher speed with the same computer. The app could just be a game and not a miner. 4.1 The currency inside the application, called "satoshi" has nothing to do with real money, crypto-currencies, and also does not carry any value in real life and is exclusively virtual coins. The developer simply calls his virtual coin in this way, and nothing more. 4.2 Virtual coins, "backs", as well as bonuses in any way can not have real value, as well as the ability to convert them into any real currency. 4.3 We do not guarantee the possibility of outputting virtual values within the application in any real means. I tried to contact them regarding this clause. It’s been weeks. Still No reply. Is Bitcoin miner app Legit?